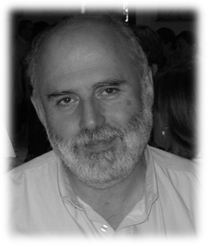 Dimitri Plemenos, Georgios Miaoulis: Intelligent Computer Graphics 2011. 01/2012; Springer. Georgios Miaoulis, Dimitri Plemenos: Intelligent Scene Modelling Information Systems. 01/2009; Springer-Verlag. Anastasios Tsolakidis, Cleo Sgouropoulou, Effie Papageorgiou, Olivier Terraz, Georgios Miaoulis: Using Visual Representation for Decision Support in Institutional Research Evaluation. Intelligent Computer Graphics, 01/2012: pages 41-57; Springer-Verlag Berlin Heidelberg 2013. Dimitri Plemenos, Georgios Miaoulis: Virtual World Exploration. Visual Complexity and Intelligent Computer Graphics Techniques Enhancements, 01/2009: pages 95-153; Springer Berlin Heidelberg. I Xydas, G Miaoulis, P.-F Bonnefoi, D Plemenos, D Ghazanfarpour: Using Visual Analytics for Web Intrusion Detection. Dimitri Plemenos, Georgios Miaoulis: Studies in Computational Intelligence. Christos P Yiakoumettis, Georgios Bardis, Georgios Miaoulis, Dimitri Plemenos, Djamchid Ghazanfarpour, Ag Spyridonos St: Virtual globe based collaborative 3D city modelling. Dimitri Plemenos, Georgios Miaoulis: Scene understanding. Dimitri Plemenos, Georgios Miaoulis: Intelligent scene modeling. Dimitri Plemenos, Georgios Miaoulis: Scene understanding and human intelligence. Dimitri Plemenos, Georgios Miaoulis: Viewpoint Complexity in Radiosity. Dimitri Plemenos, Georgios Miaoulis: Erratum to: Artificial Intelligence Techniques for Computer Graphics. Dimitri Plemenos, Georgios Miaoulis: Tools for Intelligent Computer Graphics. Dimitri Plemenos, Georgios Miaoulis: Improvements and applications. Georgios Miaoulis: Intelligent Scene Modelling Information Systems: The Case of Declarative Design Support. Anastasios D. Doulamis, George Miaoulis: Searching Multimedia Databases Using Tree-Structures Graphs. Georgios Bardis, Vassilios Golfinopoulos, Dimitrios Makris, Georgios Miaoulis, Dimitri Plemenos: Experimental Results of Selective Visualisation According to User Preferences in a Declarative Modelling Environment. Georgios Bardis, Nikolaos Doulamis, John Dragonas, Georgios Miaoulis, Dimitri Plemenos: A Parametric Mechanism for Preference Consensus in a Collaborative Declarative Design Environment. Dimitri Plemenos, I. Dragonas, A. Lazaridis, D. Makris, George Miaoulis: Towards coordination environment for collaborative declarative scene modelling. Dimitri Plemenos, D. Makris, I. Havoutis, George Miaoulis: MultiCAD MOGA. A system for conceptual design of buildings. Dimitrios Makris, Ioannis Havoutis, Georges Miaoulis, Dimitri Plemenos: MultiCAD ? MOGA A System for Conceptual Style Design of Buildings. M Koutsokeras, I Pratikakis, G Miaoulis: A web-based 3D graphical model search engine. J Dragonas, D Makris, A Lazaridis, G Miaoulis, D Plemenos: Implementation of Collaborative Environment in MultiCAD Declarative Modelling System. Dimitri Plemenos, John Dragonas, Dimitris Makris, Apostolos Lazaridis, Georgios Bardis, G Miaoulis, others: Implementation of a declarative environment in MultiCAD declarative modelling system. Dimitri Plemenos, Vassilios Golfinopoulos, Georges Miaoulis: A semantic approach for understanding and manipulating scenes. Georgios Bardis, Georgios Miaoulis, Dimitri Plemenos: Learning User Preferences at the Declarative and Geometric Description Level. Vassilios Golfinopoulos, Dimitri Plemenos, John Dragonas, George Miaoulis: Declarative design in collaborative environment..
Georgios Bardis, Georgios Miaoulis, Dimitri Plemenos: An intelligent user profile module for solution selection support in the context of the MultiCAD project. Ioanna Ravani, Dimitrios Makris, Georges Miaoulis, Dimitri Plemenos: Concept-based declarative description subsystem for Computer-Aided Declarative Design (CADD). Nikolaos Vassilas, George Miaoulis, Dionysios Chronopoulos, Elias Konstantinidis, Ioanna Ravani, Dimitrios Makris, Dimitri Plemenos: MultiCAD-GA: a system for the design of 3D forms based on genetic algorithms and human evaluation,Methods and Applications of Artificial Intelligence. Dimitri PLEMENOS, Georges MIAOULIS, Nikos VASSILAS: Machine Learning for a General Purpose Declarative Scene Modeller. E Protopapa, G Delides, G Miaoulis, D Thompson, P H Bartels: Image analysis of mesothelioma II. Discrimination of mesothelioma from metastatic serous ovarian adenocarcinoma. Analytical and quantitative cytology and histology / the International Academy of Cytology [and] American Society of Cytology 09/2000; 22(4):338-45. E Protopapa, G Delides, G Miaoulis, D Thompson, P H Bartels: Image analysis of mesothelioma: I. Differentiation of mesothelioma from adenocarcinoma of the lung. Analytical and quantitative cytology and histology / the International Academy of Cytology [and] American Society of Cytology 05/2000; 22(2):114-22. George Miaoulis, Dimitri Plemenos, Dimitri Magos, Christos Skourlas: The MultiCAD Project: toward an intelligent multimedia information system for CAD. G Miaoulis, E Protopapa, C Skourlas, G Delides: Supporting telemicroscopy and laboratory medicine activities. The Greek "TELE.INFO.MED.LAB" project.. Archives d'anatomie et de cytologie pathologiques 02/1995; 43(4):275-81. G Miaoulis, E Protopapa, C Skourlas, G Deldis: Telepathology in Greece.Experience of the Metaxas Cancer Institute. Zentralblatt für Pathologie 01/1993; 138(6):425-8. G Miaoulis, E Protopapa, G Skarpetas, C Skourlas, G Delides: Information retrieval for pathology information systems.. In vivo (Athens, Greece) 01/1993; 7(4):373-7. E Protopapa, G Miaoulis, M Ferreiro, J Panayiotides, S K Katsikas, G Delides: A new expert system for histopathological diagnosis of human ovarian epithelial cancer. In vivo (Athens, Greece) 01/1993; 7(4):369-72. Anastasios Doulamis, Nikolaos Doulamis, John Dragonas, George Miaoulis, Dimitri Plemenos: Robust Foreground Detection and Tracking using Dynamic Foreground-Background Modeling Based on Adaptive Boosting. Dimitri Plemenos, Georgios Miaoulis: Intelligent computer graphics 2010. Selected papers based on the presentations at the 3IA conference, Athens, Greece, May 2010. Dimitri Plemenos, Georgios Miaoulis: Artificial intelligence techniques for computer graphics. Invited and selected extended papers based on the presentations at the 11th international conference on computer graphics and artificial intelligence (3IA’2008), May 30–31, 2008, Athens, Greece. Nikolaos Doulamis, Evangelos Chronis, Anastasios Doulamis, George Miaoulis, Dimitri Plemenos: Incorporating Viewpoint Entropy into the S-PDB viewer for Selecting Optimal 3D object Views. Anastasios Doulamis, Fotis Liarokapis, Panagiotis Petridis, Georgios Miaoulis: Serious Games for Museum Environments. Ioanna Ravani, Dimitrios Makris, Georges Miaoulis, Petros Constantinides, Alexandros Petridis, Dimitri Plemenos: Implementation of architecture-oriented knowledge framework in MultiCAD declarative scene modeling system.